Jeff Wildung of Nassau, MN won his second NLRA series feature of the season Sunday night at the Viking Speedway in Alexandria, MN. Wildung started on the pole, and lead all 25 laps en route to his 12th NLRA series triumph, re-tying him with Ricky Weiss for fifth on the all time wins list. Weiss finished second and was followed to the line by Zach Johnson, Mike Balcaen, and Brad Parson, completing the top five. Brad Seng will carry a 110 point advantage over Mike Balcaen into this Thursday nights' season finale, the 'Prelude to the Johnny' at the River Cities Speedway in Grand Forks. Photo courtesy of Traci Palya. Full results here. Updated points here. Ricky Weiss won his second NLRA series feature of the season at the Viking Speedway on Saturday night. The win is also his 12th series win, giving him sole position of fifth on the all-time wins list. Weiss and Jeff Wildung battled for the lead early until Wildung broke while running second on lap 17. Brad Seng maintained his point lead despite not finishing the main event, as he increased his advantage to 124 points with two races remaining. The series is scheduled to race again at the Viking Speedway tomorrow evening. Photo courtesy of Traci Palya. The NLRA and its' series regulars are set to embark on their final road trip of the 2014 season this weekend with its' annual Labor Day Double Header on both Saturday and Sunday night August the 30th and 31st at the Viking Speedway in Alexandria, MN. 2012 NLRA series champion Ricky Weiss kicked off the 2014 season with a victory on the opening night of the Memorial Day Double Header. Weiss, driving the Derrick's Sandblasting No. 7, lead the entire distance after inital pole sitter Pat Doar had a tire go down at the start of the race. NLRA series action continues this Thursday night, August the 21st, at the Norman County Raceway in Ada, MN, and on Saturday night, August the 23rd, at the Devils Lake Speedway near Doyon, ND. The race on Thursday is scheduled to be the third this season, and 14th appearance overall at the three-eighths mile dirt oval on the Norman County Fairgrounds. 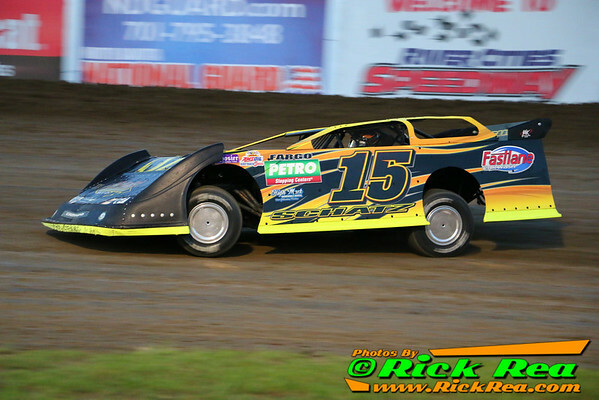 Jeff Wildung and Cody Skytland were feature winners at the Norman County Raceway in June. Brad Seng and Donny Schatz were NLRA series winners at the River Cities Speedway in Grand Forks last weekend. Seng's win on Friday night was his 26th NLRA series victory, tying him with John Seitz for the most in the series' history. Schatz's win on Saturday night came exactly one year to the day of his first series win, which also came at River Cities. On Friday night, Brad Seng, driver of the No. 12S S&S Transport Mars MB Custom took the lead from Ricky Weiss, driver of the No. 7 Derrick's Sandblasting machine on lap 16 and lead the rest of the way. Donny Schatz won his second career NLRA feature at the River Cities Speedway in Grand Forks. Schatz took the lead from Mike Balcaen on lap 15 and lead the rest of the way. 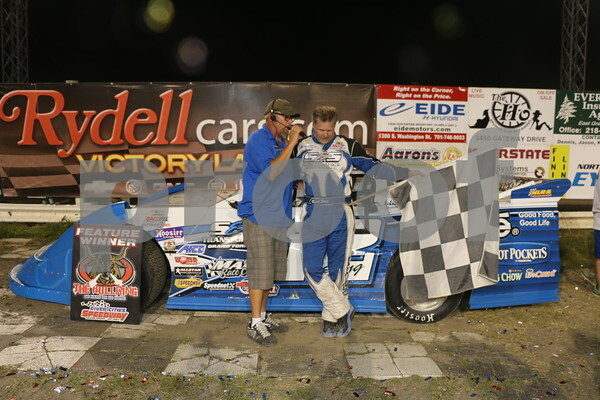 The win comes exactly one year to the day of his first NLRA series win which also happened at River Cities. Schatz's win also ends Brad Seng's win streak at four, and also keeps him tied with John Seitz atop the NLRA wins list with 26. Seng finished second and increased his point lead to 118. Photo courtesy of Rick Rea. Brad Seng won his sixth NLRA feature victory of the season last night at the River Cities Speedway in Grand Forks. Seng took the lead from Ricky Weiss on lap 16 and held on for his 26th NLRA series win, tying him with John Seitz for most all time. Seng will have a chance at becoming the winning-est driver in series history night when the series returns to River Cities at seven o'clock. Seng also increased his point lead over Mike Balcaen to 114 points. Photo courtesy of Rick Rea. NLRA points leader Brad Seng has collected his fifth win of the 2014 season during Saturday nights' visit to the Jamestown Speedway in Jamestown, ND. The win is also Seng's 25th career series triumph putting him one win away from tying John Seitz on the all time wins list. Seng is also the first driver since 2004 to win five NLRA features in one season. John Seitz won a series record seven times during the 2004 season.